Kamp-Rite Padded Chair with Mesh Back is a rather large and pleasant folding steel structure with armrests, a carry bag included, and a very affordable price. 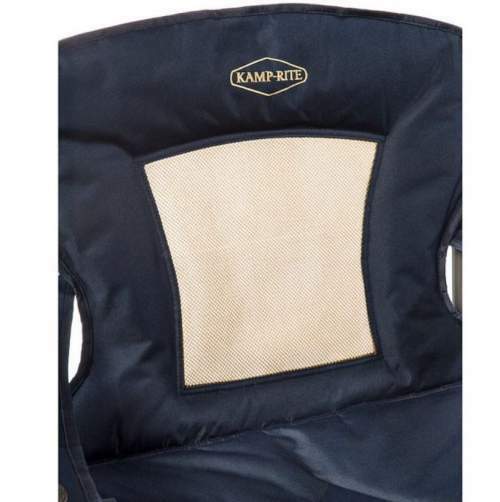 Kamp Rite Padded Chair with Mesh Back. Very reliable brand and chair. This Kamp-Rite chair is one of those that collapse from all four sides to the center, so it remains large only in one dimension. Its packed size in such a state is 39 x 9 x 8 inches (99 x 23 x 20 cm). The chair is also with armrests that are connected with bars on the front. You have integrated cup holders on both sides. As its name suggests, it is padded in its biggest part, only the center back section is a mesh shown in the picture below. The mesh area on the back. Capacity-wise, the chair can support up to 350 lb (159 kg). This should be enough for most users. This is a steel and very stable structure. Weight-wise, the chairs of this type are typically heavy, but this chair is quite lightweight for such a type and for such a steel frame, it weighs 9 lb (4.08 kg). Obviously, this is not to carry around, but this weight is reasonable. If you need something for a backpack, please check these ultra-lightweight backpacking chairs. Size-wise, the seat is roughly 23 x 22 inches (58 x 56 cm), but the actual width with two armrests is 35 inches (89 cm). The height is 38 inches (97 cm) so it is quite high but this is not a type with a headrest unless you are a short person. If you need such a chair, better check my list of chairs with headrests. The seat height is not particularly tall, the front is at 17 inches (43 cm) above the ground. But no worry, you have metal bars on the front of the armrests so it is not an issue to get in and out of the chair. I already mentioned the packed size, so if you use this chair for camping, you will need a car for transportation. For storing it at home, you have a stuff sack included, so you cat put it anywhere and it will be protected from dust. The frame is steel, and you realize that there are 8 tubes here creating four X-shaped structures with legs, plus two long back poles. 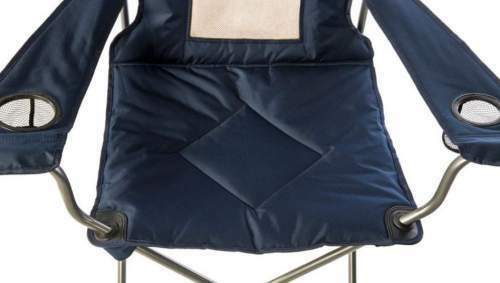 The picture below shows its padded seat, and the same padding is on the back except in the center zone. 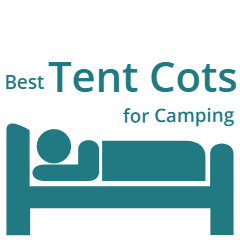 The feet are particularly large so this is a floor-friendly design, good enough even to be used in a large family camping tent. Plastic caps are there so you will not have problems using it anywhere. The Amazon price for this chair is around $43 as of the moment of writing this text. I find it more than fair for such an item. 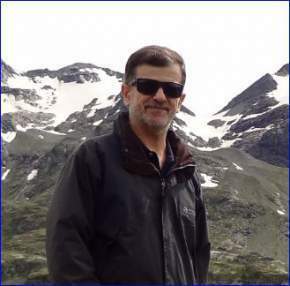 Please follow the links to check for updates. Dimensions (W x D x H): 35 x 22 x 38 in (89 x 56 x 96). Packed/Folded size: 39 x 9 x 8 in (99 x 23 x 20 cm). I show this Kamp-Rite chair side by side with two other built in the same style, but the dimensions and weight are quite different, as well as the seat height. This is on purpose, to see some other options that might better suit your body size and weight. The other chairs are also described in detail in my separate reviews, so please follow the links to read more. In summary, this Kamp Rite Padded Chair with Mesh Back is really nicely built, the price is reasonable, the quality is undeniable, this is a very reliable brand, and I can fully recommend this chair to anybody. You might also want to check their Kamp-Rite Chair with detachable footrest. If you need more options, please check my long list with folding camping chairs, this chair is also included there. Otherwise, just search in the category Camping Chairs on the right above. Check this CORE Equipment Tension Chair with Carry Bag which has some interesting features and bonuses. Thank you for reading. If you have any question or comment, please use the comment box below. I wish you a nice day.